Connectors Executive Network hosts its' first successful event! 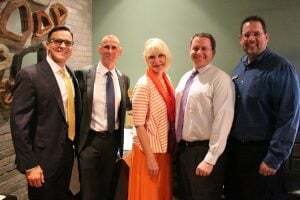 The Connectors Executive Network met last night, in Boca Raton, to discuss "best practices for hiring and retaining great employees." The turnout was incredible! Some people traveled quite a few miles, some even had to endure rush hour traffic just to attend the event! The journey was worth it, I can guarantee you that much. "The whole point of these events are for the guests to gain from them," said David Bennett. "I want our guests to learn something new, to walk away with an action item, whether it's a new way or idea on how to make results driven changes at work or maybe the event produced some great new business connections!"